Tuscan Tomato and Bread Soup. - Apply to Face Blog. Home » Soups » Tuscan Tomato and Bread Soup. Tuscan Tomato Soup is full of fabulous bold flavours and incredibly delicious. I always feel super sophisticated after just one spoonful. Within the last two weeks I have been the victim of two phone calls that made me feel a complete and utter tw.t……. Whether it is my dumb blonde/grey nature or my deeply ingrained reluctance to be rude that led me to be quite so gullible, I know not. What is obvious is that I am as streetwise as a native octogenarian from St.Martins Island. All of this nonsense going round in my head prevented me from remembering that we DO NOT even have internet with B.T for the love of God….I mean can you actually believe how stupid I am? I can’t. It was only with my finger hovering over a DOWNLOAD button for a program that allows remote access to my computer that I started to wake up and smell the bullsh.t. Miraculously the line went dead and I took the opportunity to phone B.T and check with the real deal. “No Madam I can assure you they are not from B.T and you do not have broadband with us either………….. As I sat there incredulous the phone rang again and yes indeedy it was my friendly robbing basta.d “B.T” engineer enquiring whether I had managed to download the remote access program so that they could gain access to my computer and save the day? !………But do you know what? Even then with him about to rob me blind I still could not manage to be rude. Instead I told him with heart pounding and the querulous voice of that octogenarian from St.Martins “I’m not having anymore of this! I don’t believe you are who you say you are and I’m going to put the phone down”!!!!!!!!!!!!! Gosh I’ll bet he’ll remember that dressing down for the rest of his criminal career. Perhaps it even made him see the light………not. The second phone call was from a completely different side of the tracks. It was your archetypal dirty phone call…….Yet again with naive politeness I asked him to speak up as I couldn’t quite catch what he was saying……Twice I did this as he was breathless and almost whispering….I did think I caught some rude words but dismissed them, ” Can you speak up dear please? Let me just go somewhere quieter. “…………so I did and then he did. He told me all about the length of his manhood and what he would like to do with it…………..Why me?!!!! 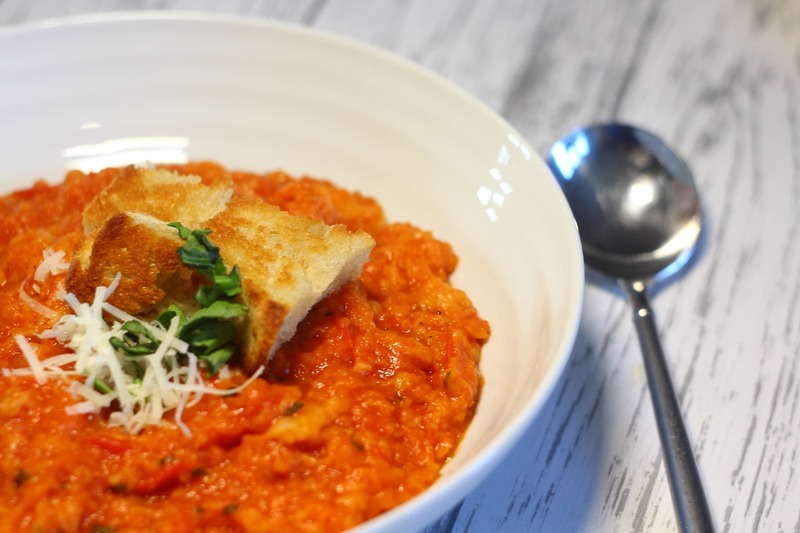 This is an absolutely fabulous rustic soup full of the robust and vibrant flavour of tomatoes and basil .Topped with chunky croutons and parmesan cheese it is the stuff of an incredible lunch or special supper. I have fallen deeply in love with it and plan to make it a regular on my winter table if just for it’s cheering properties alone. It tastes deeply of summer and the Mediterranean and that can never be a bad thing before, during or after a British Winter. 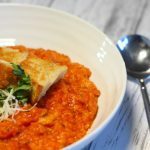 It is a relatively simple soup where the ingredients shine brightly in a glorious ode to the Tomato. Once everything is chopped and popped into the saucepan for a jolly good bubble and meld together the fabulous vibrancy begins to develop. When the bubbling is over and the blending complete adding the ciabatta to meld with the deeply red tomato stew is spot squeezingly satisfying. It appears to actually melt away transforming the soup into a bowl of unctuous summer holidays. I for one imagine myself in a sophisticated mediterranean setting……. I’m thinking olive grove with a glass of chilled white wine in my blemish free manicured hand, my vintage bike resting against a stone wall and me free of middle aged blubber and proud owner once again of a taut pelvic floor……..Bliss if only for a lunchtime. 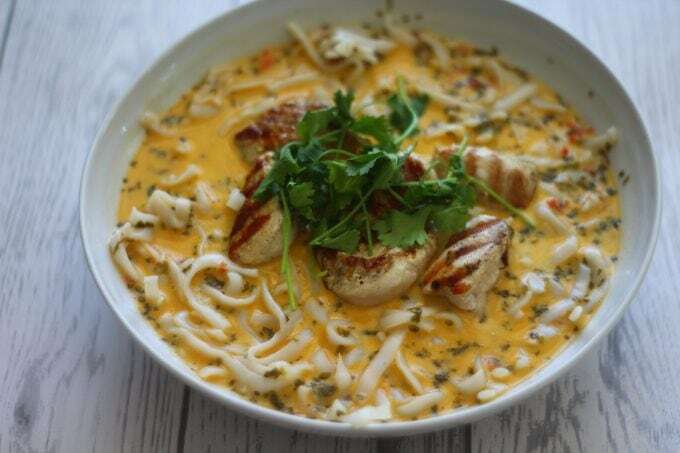 A fabulous soup bringing the Mediterranean right to your table. Full of the robust and vibrant flavours of ripe tomatoes and basil melded with delicious ciabatta bread this is a real crowd pleaser. It can be reheated after the fact to suit a quick lunch or family feast. Preheat the oven to 200 C. I use a food processor and whizz the shallots, carrots and garlic to a fine dice before tipping into a large saucepan with a generous splosh of olive oil. You of course can do the whole lot by hand. It will be pureed later so no need to go crazy with the chopping. Simmer gently away for five mins or so until the whole lot is softened. Meanwhile wash the tomatoes and chop in half. I use my thumbs to push out all the seeds into a bowl and then chop the remaining tomato flesh into quarters into another bowl. Give the tomatoes a generous seasoning of salt and a mix through. Pour the wine and stock into the saucepan before adding the pepper, sugar and basil. Give the whole lot a stir through and simmer away for a few mins. Add the now seedless tomatoes and leave again to bubble gently away but this time for about 15 minutes. In batches puree this tomato mixture in a food processor and return to the saucepan. Add the tomato juice and chunks of ciabatta. I use a potato masher to break the bread down into the soup but a wooden spoon would suffice. Season carefully to taste. Garnish with a generous amount of Parmesan Cheese and Croutons. 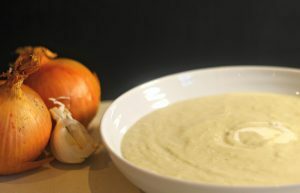 Here are some more fabulous Soup Recipes – Baked Onion and Garlic Cream Soup. « Roast Butternut Squash Winter Salad. These things could only happen to you couldn’t they!! ? As for bread in soup, who knew it was actually a real thing, because I sometimes make ‘bread bolognese’ & people think I’m a bit odd! Many years ago I kept getting what i thought were dirty phone messages left on my answer machine. Heavy breathing. After four or five of these i finally heard enough and caught the word Elsie. Only then did i relaise that aunt Elsie in her 80s hadnt quite got to grips with answer machines and it was her heavy breathing id got. As for you soup I bet that is delicious I love rustic soups like this. I recommend getting one of those phones that filter out the nuisance calls! Soup looks and sounds delicious and perfect for these chilly days.